Learn to skip count by 2s. Count 2, 4, 6, 8, 10, 12, and so on. Find the number of pictures in each set. Count by twos. The penguins on the ice floes are counting by twos. Can you fill in the missing ones? Count by 2s on this worksheet and fill in the missing numbers. The page is decorated with two karate illustrations. Skip count by 2s from 0 up to 40. Fill in the missing numbers on the number line. Skip count by 2s, starting at 2 and ending at 20. Write the missing letters in the circles to help the mouse reach the cheese. Fill in the caterpillars as you skip count by twos. Count by 2s up to 100. Fill in the empty boxes to complete the table. Count by twos. Color every second number on the hundreds chart. 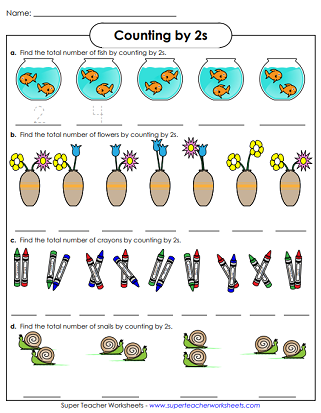 Print this skip-counting worksheet and answer the questions by counting by 2s. Fill in the grid, counting by 2s. Answer the questions on the bottom of the page to practice skip counting by 2s. The numbers on the rows of balloons count by two. Complete the pattern. 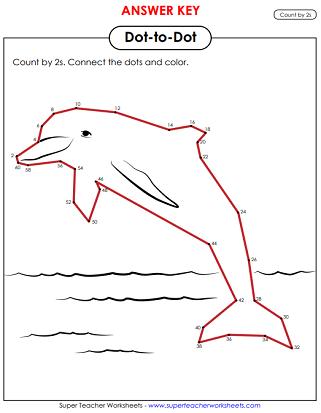 Count by 2s and connect the dots to create a picture of a jumping dolphin. Count by threes, fours, tens, or fives. Other skip counting worksheets can be found through this skip counting index page. Practice counting larger two, three, and four digit numbers. 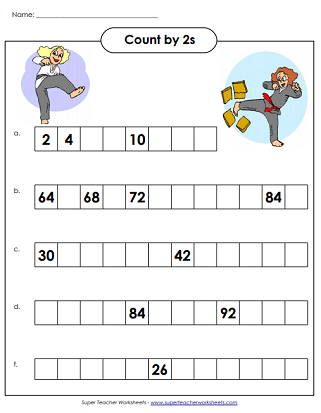 These worksheets teach students the difference between odd and even numbers. These are our most basic counting worksheets. Students practice counting up to twenty. We have all kinds of hundreds charts, hundreds chart games, and even 99s charts. These easy color-by-number worksheets are fun for kids of all ages.